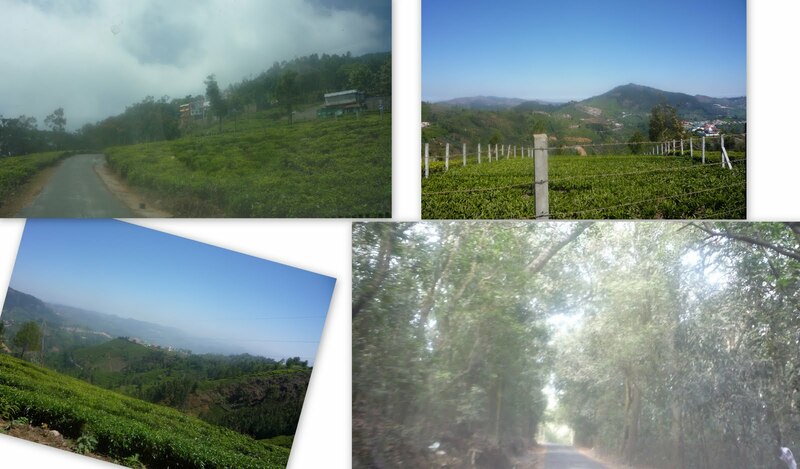 Beginning of February saw us pack up for a family holiday at Coonoor – a beautiful hill station close to Ooty. Only, it has the advantage of being far less crowded and more peaceful. My sister zeroed in on this place after wide research to ensure it fit all the requirements - the maiden journey of her 3 month old baby, the activity appetite of her other 5 year old, the long drive passion of my BIL, enough of excitement for the just wed and enough relaxation for the grandparents lot. Phew! A long list indeed! We all assembled at Coimbatore and then drove down to Coonoor. Our stay was booked at Bison Country , a pretty little resort which had 4 cottages and 2 rooms, each of them offering a stunning view of the towering lush green hills right opposite to the place. The entire resort was so beautifully landscaped with lawns and a wide variety of flowers. This coupled with the farm animals that freely loitered the place(a couple of ducks, turkey, hens and pretty rabbits) gave us the comforting feeling of sitting right in the lap of mother nature. Just standing in those green surroundings and silence that was disturbed only by the sounds of the wind and birds was such a soothing experience. It proved to be an ideal setting for the family time that we had planned for. After a much needed noon siesta post the road travel, we spent the evening at the resort itself, engaging ourselves with hot tea, snacks and games while my nephew had his fill of fun playing with the animals. As the sun went down and the night set in, it began to get quite cold and we all settled around the camp fire. After a fun session of songs and chit chat, we treated ourselves to the hot and yummy dinner prepared by the caretaker couple. The resort also houses a small library of books and DVDs and the collection was pretty good. They have facilities for a few indoor and outdoor games as well. Placidity at its best! I just couldn’t take my eyes off the beautiful sight in front of me. The water was so still that it looked like a huge mirror reflecting the trees and mountains all around it. That coupled with the complete silence just took my breath away. I just drowned and drowned in the peace and quiet and the overpowering beauty of nature that stretched out before me and had to be shaken back to my senses when we got ready to leave the place. This was a trip that completely soaked us in nature, leisure and wonderful family time. So if that’s what you are looking for, pack your bags and set off to this place!! This was meant for that also :) For reading later on with nostalgia ..
Lovely pics..Coonoor is a lovely hill-station that is still untouched by commercialism unlike Ooty. Thanks a lot Krishna and welcome to this space!